High-density storage solutions that maximize your storage space while protecting your most valuable materials. The storage needs of state and local government are unique and vary widely – from expansive warehouse facilities and vehicle/machinery centers, to multi-department administration buildings and data processing centers, to many types of healthcare facilities. Vidmar® delivers custom-designed solutions for these and more. Our parts storage accommodates items of any size, shape, and weight. And our vertical storage solutions support your warehouse's efficiency goals by promoting superior organization, speed, and inventory control. Store up to five times more material than traditional shelving in half the space with storage cabinets. 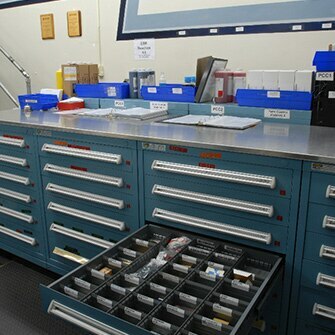 Use mobile cabinets and toolboxes to boost productivity on the move. And look to vertical storage solutions for your bulk storage needs. An overview of the Vidmar® Vertical Lift Module (VLM) – this high-density vertical storage solution can save you space, time, and money by promoting faster part and tool retrieval, and increasing storage capacity by up to 75%.